PhD student in Marine Science at the National University of Ireland, Galway & Irish Research Council Government of Ireland Postgraduate Scholar. Interested in computational approaches to issues at the intersection of fisheries and climate change. Currently modelling mackerel collective behaviour. MSc in Biodiversity & Conservation (with Distinction) from Trinity College Dublin; B.A. in Environmental Studies from Vassar College. If you’re a friend of mine, then welcome to my recommendations for Iceland! If you’re stumbling upon this blogpost from the wider web, also welcome! I used to live in Iceland and my partner (Jónsi) is Icelandic. Hence, we get a few requests to provide recommendations for travelling in Iceland. Most of these recommendations are for Reykjavík & the South Coast, as that’s what I’m most familiar with. A disclaimer: we haven’t lived there for a while and Reykjavík is changing rapidly. I apologize if some of these attractions aren’t around any more. On the flip side, if you have other recommendations, let me know because I’d love to check them out on my next trip! Be prepared, things in Iceland are very expensive. Consumer prices are about 50% higher than in the States. Cards are used almost everywhere and you shouldn’t need much local cash. Almost everyone speaks English, especially in the younger generations. It’s not their first language, however, and they appreciate it (or think it’s cute) if you attempt a few simple Icelandic phrases. The hot water in Reykjavík and the surrounding area has a slight sulfur smell because it comes directly from the hot springs. It’s good for you! Just takes some getting used to. Icelandic tap water is delicious and safe to drink. It’s some of the best water in the world. Just let the cold tap run for a bit if you’ve recently used the hot water. Do try to avoid buying bottled water!!! At all times of the year, be prepared for inclement weather and high winds, i.e. umbrellas are totally useless and do not attempt a hike without proper footwear, clothing, and gear, even if the weather looks benign. It can change quickly. Skyr - Icelandic-style ‘yogurt’ that’s actually a soft cheese, fun fact! It is very high in protein, low in fat, and comes in many different flavours. Plokkfiskur - fish & potato stew. 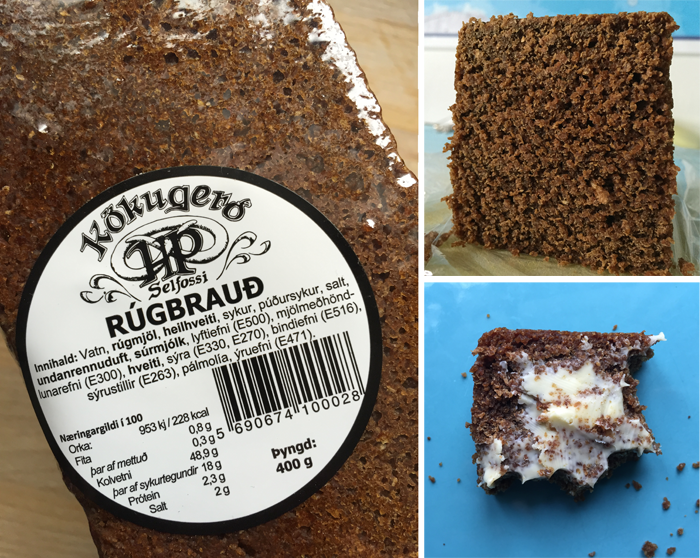 Rúgbrauð - steamed brown bread. Around Christmas or Easter, there’s a drink that’s a combo of Appelsín (orange soda) and Maltextrakt (malt soda). It comes in many different forms, either called Malt og Appelsín, Jólaöl/Páskaöl, or just mixed at the dinner table. A bit of an acquired taste, but I love it. Chocolate-covered liquorice candy, but if you don’t like salted liquorice, be careful with the pick ‘n mix: avoid anything coated in big salt crystals or anything skull-shaped. It’s very expensive to eat/drink out in Iceland, so try to buy most of your food at grocery stores (Bónus is cheapest). Alcohol is only sold in state-run stores (Vínbúð), so don’t buy it in grocery or convenience stores. They carry beers that look the same, but are like 1.5% ABV. If you drink, it’s a good idea to use your Duty Free allocation on the way in. You can buy local beer & spirits when you land. The best craft brewery is Borg. They make many different beers, often seasonally-available. My favourite budget beer is Brío. It’s expensive to stay in town, so if you stay a little outside, there is a bus system (Strætó). You can download the app to buy tickets (€4/$4.7, valid for 1hr 20min). Taxis are exorbitantly expensive. The public swimming pools with their outdoor hot tubs are a MUST. They’re the main hangout of the locals. The biggest in Reykjavík is Laugardalslaug and there’s one in the center of town, Sundhöll, but my favourite is in my old neighbourhood - Vesturbæjarlaug. It’s more of a local spot, quiet and recently renovated with many different hot tub options and a heated pool for kids & lap swimmers. I like going early in the morning to hang out with the retirees. In general, the best combo is to go to the pool and then get a hot dog from the ubiquitous hot dog stands. There’s also an excellent coffee shop (also serves beer) called Kaffihús Vesturbæjar opposite Vesturbæjarlaug. They have amaaaaaaazing liquorice macarons! Going up to the top of the church (Hallgrímskirkja) costs a few euros/dollars and can have a long line, but it’s worth it for the view of the city. There’s a nearby cafe, Cafe Lóki, that serves traditional Icelandic food for a decent price. There are multiple museums in Reykjavík. My favourite is Þjóðminjasafn Íslands, the National Museum of Iceland. It has exhibits on the heritage and history of Iceland, including the geological history. Speaking of food, a lot of it is expensive for what it is. The hot dog stand down by the harbour, Bæjarins Beztu, is iconic and a must-do. My favourite cheaper places are the Noodle Station (Thai-style noodle soup) and Mandi (shawarma, falafel, etc.). The best ice cream is Valdís. It’s in an area called Grandi, which is becoming more popular with locals as the center of town becomes more and more touristy. There are two new food halls (Mathöll) at Hlemmur and Grandi. For upscale food, my favourite restaurant is also in Grandi: Matur og Drykkur. They do updates to old Icelandic recipes. Kex Hostel - a good place to hang out (and stay, if you can manage to get a room). They do a decent happy hour deal, too. Skúli Craft Bar - specializes in Borg beers. It’s expensive, but the beer is great. Bjórgarðurinn (The Beer Garden) - a bit outside the city center in the Fósshotel, but they do great deals on craft beer flights. In general, I’d recommend not shopping in Iceland. It’s just too expensive and most tourist shops sell the same mass-produced tchotchkes. They’re called “puffin shops” by the locals and have replaced many beloved businesses in Reykjavík. That said, if you do want a couple of souvenirs, there are some smaller, independent shops throughout the city. Just keep your eye out and check side streets and bookstores, rather than the puffin shops. The best souvenir, IMHO, is a lopapeysa. To get a traditional, handmade Icelandic sweater, the best place is the Handknitting Association of Iceland’s store in central Reykjavík. You can also check for used/vintage sweaters and other interesting finds at the Kolaportið flea market or in charity/thrift shops around town. If sweaters aren’t your speed, there are three Icelandic outdoor-wear brands. Icewear is less expensive and they do good accessories. 66°North and Cintamani are higher-end (think Patagonia or North Face). They both have flagship stores in central Reykjavík (the Cintamani store has a slide inside! ), stores throughout the country, and outlet stores in the Reykjavík suburbs - great for getting good deals on high-quality equipment. For day trips around Reykjavík, you can take a bus (or, better yet, drive) to the trailhead for Esja, the mountain that overlooks the city. The trails range from relatively easy to challenging. There’s also the Hveragerdi Hot Spring Trail, a hike along a “thermal river” with many different swimming spots. You can also book many tours from Reykjavík; Arctic Adventures is a good tour operator and offers many options. The Blue Lagoon is cool and is becoming iconic, but it’s expensive and will be busy. Don’t let anyone tell you it’s natural, either. It was an accidental discovery by locals when the silica-rich effluent from the nearby hydrothermal plant coated rocks and formed a warm pool. There are other nice baths like the Laugarvatn Fontana, or a great hot pool called the Secret Lagoon in Fluðir. You can also find hidden hot pots and public pools throughout the country. One note: if you’re heading to Iceland in the winter (November - May), be prepared to be unable to leave the city due to weather. Also, don’t come just to see the northern lights. Even when there’s high solar activity, you need a clear night and pure darkness to see them. So, of course, you can’t see them during the summer when there is no night. During the winter, there is a chance there won’t be a clear night during your visit. You can check the aurora forecast here, but it’s a crapshoot, more or less. Your best bet is to rent a cabin in the countryside with a hot tub so you can sit out for a long time! The Golden Circle is a classic day trip with some great sights. You can do it in 5 hours, but my recommendation is to start early in the day and take your time. You can take a bus tour or drive it yourself. I’d recommend doing a day trip (during the summer when there’s enough light) or an overnight to the Snæfellsnes peninsula. It’s north of Reykjavík and offers a chance to see a little bit of everything (glaciers, mountains, lava fields, waterfalls, beaches) in one trip. It’s also, hopefully, a little less full of tourists than the Golden Circle. Check out this driving tour. The South coast is a popular route and there’s plenty to see (here’s another driving tour). It became more popular after a recent Justin Bieber video, but we can ignore that. Reynisfjara beach, with the black sand, is amazing, but be careful. A few tourists have been killed recently by rouge waves when they get too close to the water. Jökulsárlón, the glacial lagoon, is also a great stop. Just don’t climb on any icebergs, as they’ve been known to flip. Between the beach and the lagoon, there are a couple of great waterfalls and other sights. Jónsi is from a town along the route called Kirkjubæjarklaustur. There’s a good cafe in town called Systrakaffi. When renting a car, get the gravel insurance if you’re planning on going on any unpaved roads (of which there are many). Driving off road is illegal. Icelandic nature, especially moss that covers most of the country, is incredibly delicate and slow-growing. Road conditions can be unpredictable, even in the middle of the summer, so check this website to see which are passable. In general, don’t go on any “F Roads”, since they’re only safe for kitted-out SUVs. Here are some resources for how to stay safe. This website (and app) allows you to register your itinerary with Search & Rescue so they know where you were planning on going, if anything happens. If you’re off the beaten track, the app also can send your location to Search & Rescue in an emergency, even if there’s no service. Also, fuel stations, convenience stores, and rest stops are few and far between in the countryside. Make sure you keep your gas/diesel/petrol tank full and be aware that there may not be a lot of bathroom options. I can’t believe I have to say this, but please don’t defecate in people’s gardens or on public paths. Just be respectful and always clean up after yourselves, no matter where you go! Enjoy your trip! It’s an amazing country and no matter where you go, there’ll be something amazing to see. © 2019 Sophia N. Wassermann. All rights reserved.